2015 marks the launch of another exciting world premiere for Graff Luxury Watches: the Diamond MasterGraff Structural Tourbillon Skeleton, powered by the Graff Calibre 6, a new and exclusive skeletonised tourbillon-driven, hand-wound movement. The MasterGraff Collection is a display of technical inventive talent, showasing Minute Repeaters, Ultra Flat tourbillons and Automatic Skeleton watches – all of which feature proprietary designed movements housed within Graff’s unmistakable faceted design. 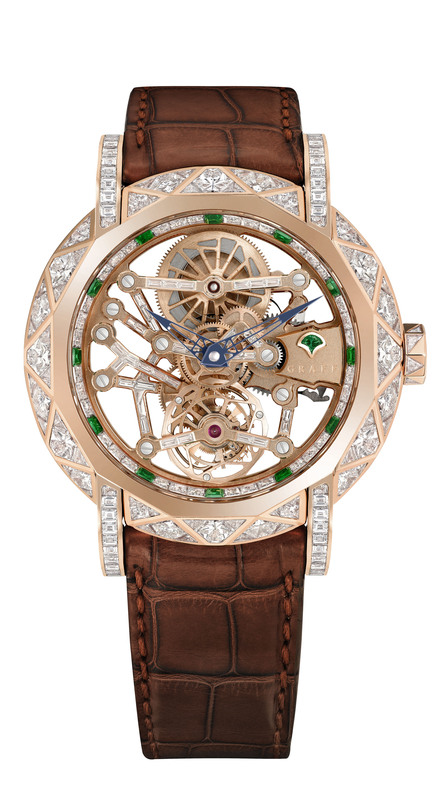 Encompassed in this exceptional collection, the Diamond MasterGraff Structural Tourbillon Skeleton is a visually truly striking timepiece, with its 46mm case incorporating the highly-sculptural patented diamond ‘Invisible Structural Setting’: consisting of two triangular cut diamonds set on either side of an hexagonal cut diamond, positioned within a white or rose gold framework – it replicates the facets of Graff’s signature bezel in diamond form. Diamond setting on the Diamond MasterGraff Structural Tourbillon Skeleton’s bridges. When Graff Luxury Watches launched in 2009, we pledged to push the boundaries of horology and diamond design, taking each new collection to the next level. This ethos is perfectly epitomised by the launch of the Diamond MasterGraff Structural Tourbillon Skeleton, featuring our sixth proprietary movement carefully crafted by our highly experienced team. The introduction of diamond bridges is highly innovative and further exemplifies our skill in combining advanced watchmaking with diamond expertise. Diamond models are available in white or rose gold, with ultra-modern, non-diamonds variations crafted from black titanium or black DLC and brown DLC featuring rose gold detailing. Diamond MasterGraff Structural Tourbillon Skeleton: a magnificent new addition to Graff’s Technical timepiece collection. Post edited by Claudia Carletti, Jewellery Through Time. All material courtesy by Graff.